Drass, Apr 15 (KNS): Braving adverse weather conditions and avalanche threats, the BRO's Project Vijayak after making all efforts has cleared the snow from Drass side to Zojilla Pass on Srinagar-Leh highway which recorded heavy snow accumulation during winter. Every foot of snow proved a challenging task for snow clearance teams of Project Vijayak as they approached towards Zojilla due to unprecedented snow accumulation. 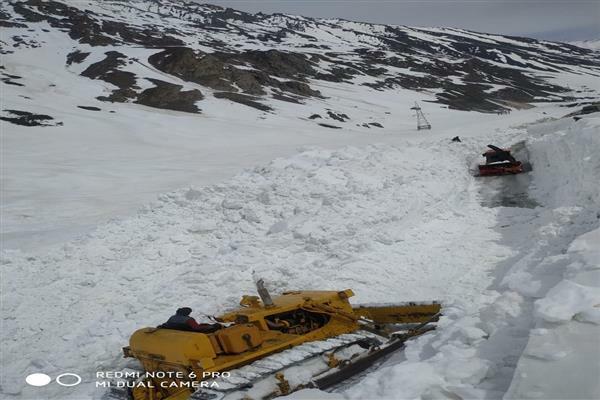 Commander 762 BRTF of Project Vijayak Col Rajeev Lohani said that men and machinery worked without break to clear snow for making the strategic highway motorable. Sonamarg -Leh road remains closed from December to mid-April due to heavy snow accumulation on the highway. This winter extremely heavy snowfall occurred during winter and heavy snow has accumulated at Zojilla Pass. “The whole road from Zojilla Pass to Drass falls under heavy avalanche zone. Snow clearance team had a tough challenge on daily basis, but 55 RCC of 762 BRTF of Project Vijayak went ahead with the challenge. The team has reached zero point which is a heavy avalanche prone zone,” commander 762 BRTF said and the snow clearance may take some more days for widening activities before the Highway is officially thrown open for public.